What if you knew which customers would most likely respond to a campaign or marketing promotion? Or knew which customers are at risk for attrition and if given the chance could provide retention offers that significantly reduced the risk of customer attrition? What if you knew the best cross-sell/up-sell opportunities with your customers? What if you and your organization knew the best action to take with each customer right now? How would it help your business if you knew each customer’s lifetime value? What if you could easily find ways to increase customer repeat visits and grow loyal and profitable relationships? What if you had a way to deliver a smarter, personalized, seamless customer experience regardless of the channel? For many customer-centric organizations, having a solution to these questions would be a dream come true. For many organizations, creating positive and memorable customer experiences is a goal they are still striving toward. The now well established age of the empowered customer has many organizations scrambling to relate to each individual customer on their terms with customized offers that fit their needs and desires. Many organizations understand that in order to retain, grow, and acquire customers, they must improve their interactions with the customer and build strong knowledge-based relationships with customers. 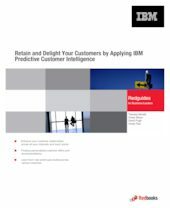 This IBM® Redguide® publication introduces the IBM Predictive Customer Intelligence solution and highlights the business value of the solution. It provides a high-level architecture and identifies key components of the architecture. The guide includes real-world customer case studies of implemented solutions in various industries.